Yusen Logistics opens two offices at the Mexico City Airport. 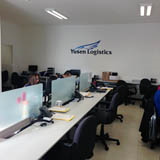 Yusen Logistics (Mexico) S.A. DE C.V. opened two offices at the Mexico City Airport on June 1. By establishing a base on the airport front lines to manage its own air transportation operations, the company aims to realize competitive freight procurement and detailed transportation management of imported and exported freight. With the rapid growth of the automotive industry and increase in imported freight in Mexico, the need for detailed transportation management is rising. To respond to this demand, Yusen Logistics has opened a “Customs Office” for air import within the free trade zone of Mexico City Airport. Until now, the company conducted these operations through an agency, but by managing these operations internally, it will realize the smooth implementation of various kinds of transportation control, such as checking freight status within airport transit shed, ensuring efficient customs clearance and supervising loading of trucks. In addition, a “cross dock office” for air export has been opened outside of the airport. By taking over tasks previously handled by an agency, such as negotiating freight charges with airlines and issuing air waybills, Yusen Logistics will provide competitive freight charge procurement and a high quality transportation operation. Looking ahead, the company plans to further improve the quality and marketing power of its air transportation service for freight departing from and arriving in Mexico by arranging a similar structure at Guadalajara and Monterey airports. Yusen Logistics (Mexico) was established in 2008 and employs around 100 people, providing logistics services through five bases, including the headquarters in Mexico City, branches in Monterey and Celaya, and the two aforementioned airport offices. Its cross-border trucking operation ships items around 15,000 times between the U.S. and Mexico per year, while domestically, it also improves its services such as by providing milk-run transportation for auto manufacturers. Yusen Logistics positions Mexico as a priority region in the Groups mid-term business plan “GO FORWARD, Yusen Logistics -Next Challenges-“, and aims to further expand the network in future. Yusen Logistics (Mexico) S.A. DE C.V.
Almacen Fiscalizado Numero 5 Aduanadel AICM Camino Penon Texcoco S/N, Col.Penon de los Banos, 15520 Delg. Venustiano Carranza, Mexico, D.F. Francisco Sarabia 18A, Col. Penondelos Banos, Zona Federal del AICM, 15520 Delg. Venustiano Carranza, Mexico, D.F. This entry was posted in Mobile LED Trucks and tagged Expands, Forwarding, Freight, Logistics, Mexico, Operations, Yusen on July 22, 2015 by MobileLEDTrucks.